I heart Sarah Richardson too. She’s been a design star for quite a long time up here in Canada – starting with her original show “Design Inc”. She always has a fresh view on creating a space and I love her casual elegance. She certainly keeps me inspired. .-= Heather @ what’s happening this week´s last blog ..Living Vicariously Through My Sister’s Garden =-. I have been lucky enough to watch a few of her shows and love them! Thanks for sharing her website. It is wonderful! .-= Stacy@RedDoorHome´s last blog ..Tick Tock – A Newly Painted Clock =-. I’ll have to look her up online. We no longer get HGTV. Her style is very lovely and not cluttered. .-= Becky K.´s last blog ..Lily Mosaic and Grandma Update =-. Thanks for sharing those photos of her house. I have only seen a couple of her shows on doing this house. I saw the dining room one not too long ago and how she was choosing the wallpaper and then the wicker chairs so it didn’t get too formal. I love her mixes of colors and styles. I have to have color, too. Can’t do the all white look. .-= Kim´s last blog ..My Master Bath =-. She is simply the BEST!!! Such a talented, successful lady .. yet she seems unaffected by her success – down to earth, creative, smart .. and Canadian!! Yea Sarah! love her! i love the show!! i recorded all the episodes on the DVR. i think you can see them by going thru HGTV website too. .-= kim´s last blog ..Thrifty Weekend Treasures =-. I have seen the living room and master bedroom episodes and love her as well. I always liked her Design inc show too. That house is amazing. It cracks me up though, because from her Design Inc show, I never would have imagined her as a country girl. .-= Kristia@FamilyBalanceSheet´s last blog ..Breathe. Exhale. Return to Center. =-. Sarah Richardson is awesome. I watched her shows years ago and didn’t care for them too much because they seemed very formulaic and all the rooms ended up looking the same, but now she uses such unique pieces for inspiration. And she mixes high and low pieces. Those great wicker chairs in the dining room are Ikea! I wish they would show the Sarah’s Cottage show here in the U.S. …. that one looks amazing. .-= Erin´s last blog ..Summer’s glory =-. I wish they would show Sarah’s Cottage here in the US also. Loved the one on the farm house. Have them all on tape! I love Sarah’s House too! I have it DVR’d to catch any reruns… She has Sarah’s Cottage too which is based in Canada, so doesn’t show in the USA for now – you can watch bits and pieces of it online. Love her style and she herself is too cute :) Makes me wanna buy a farmhouse! .-= Megan McGhee´s last blog ..Grace For Today =-. I discovered her new show about the farmhouse “redo” a couple of months ago and fell in love. I, like you, get bored very easily of the same thing and am constantly looking for something fresh and new or at least different from everyone else. Ha! I enjoy her show because she is both talented and fun to watch. She and her assistant are hilarious together! I love her mix of pattern and color. It sort of reminds me of Kathyrn Ireland a bit. If you haven’t seen her style go check it out. It’s wonderful too! I have not seen her show and I’m thinking I really should be watching. 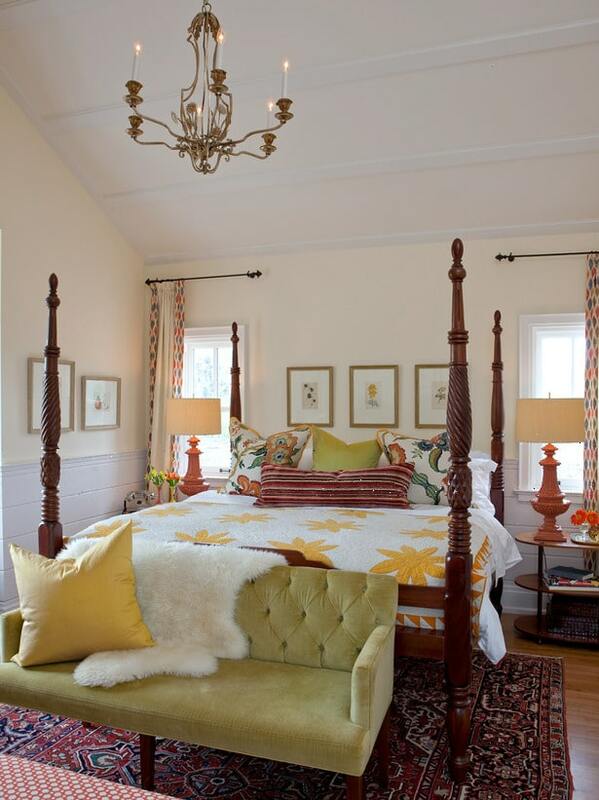 I love her use of colors with fabrics and furniture. I would consider her style, my style which I have never put a name to. Oh I wish she could come to my house. I’m so decor challenged! .-= Jessica ´s last blog ..Yummy, Yummy Banana Cream Pie! =-. I heart her show, too! I Tivo it and watch reruns of the last house she did as well as this new farm house! I loved the challenge with the two kids bedrooms! .-= Gail´s last blog ..Have An Easy, Breezy Move =-. .-= kasey´s last blog ..i like to read =-. I was hooked just by one episode. I love how she had a budget of 15,000 dollars for a bedroom, the one with the yellow and white quilt. I have a love for pattern and color and try desperately to make it work in my house. 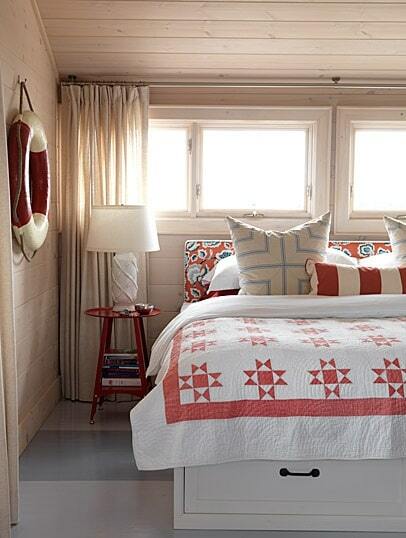 I am thinking tartan plaid curtains with my madras/stripe bedding in my boys rooms. Perhaps I should look at her site for inspiration. .-= Annelise Wilcox´s last blog ..Back Porch Inspiration and Story Board =-. I have been a fan of Sarah’s since her Room Service days. I have watched all the Sarah’s House shows and the farmhouse is by far my fave . I loved the entry and the kids bath, colorful, but tasteful. .-= Annie@A View On Design´s last blog ..Beaumont Provincial flair… =-. I adore her! I haven’t seen any of this season but WOW was last season great!!! I too have watched Sarah for years and LOVE her! The Farmhouse series is my favorite, however, by far (although Sarah’s Cottage was great too). I must say that if I were able to choose a designer to work with, I would choose Thomas Smythe (Tommy in her show). He has such a great sense of humor, and I’ve always loved his homes which have been featured in Canadian House and Home magazine. The chemistry between him and Sarah definately add to the fun of the show! I agree with what your saying. Love Sarah and Candice! I think a lot of the shows on HGTV have become a joke. If one more couple on “House Hunters” joke about where the man is going to hang his clothes (as she gets all the closet room, tee hee), or have realtors, all of whom call every tub a “garden tub” or maybe they can tell me what shower isn’t a “stand up shower”. I don’t know many people who lay down to take a shower. I miss some of the older shows with Chris Madden, for example. I absolutely LOVE the farmhouse reno she’s doing! I love how she really just mixes everything up and it goes! LOVE her! Well the one thing I took from Saturday night’s show was Sarah stating that all rooms do not have to match….woohoo!!! Finally somebody said it out loud. I love her show!!! She has amazing talent. She is my absolute favorite on HGTV. .-= susie´s last blog ..~Two Preppy Giveaways~ =-. I love this show! I’ve been watching the past 2 seasons and was sad to watch the finale of the farm house on saturday! It’s basically the only show I watch. I have recorded all the episodes and watch them over and over again! Her farm house is my dream home! I’m hoping they begin Sarah’s Cottage this saturday! I love her philosophy on color in a home- use a different color for every room. I have really enjoyed the farm house reno, but the previous season, which went much more in a mid-century modern direction was also fantastic. I have to say, though, that her idea of what qualifies as a “bargain” and mine are astronomically different! .-= Rebekah´s last blog ..God Save the Queen (and King) =-. The farm house that was just finished makes me swoon. I loved every room she did in this house…and recorded the whole thing. When my husband asked why I have it taking up space in the recorded shows, I told him that he needs to see it all with me because this is the house we will build when we win the bazillion dollar lottery (of course it would help if I actually bought a ticket). I have learned quite a bit about decorating from watching her shows. .-= Black Eyed Susans Kitchen´s last blog ..SUMMER LOVIN…HAVING A BLAST =-. I must admit I don’t watch the show but this really makes me want to tune in. I don’t have a cottage look in my own home but I do truly love it. And this looks fantastic. 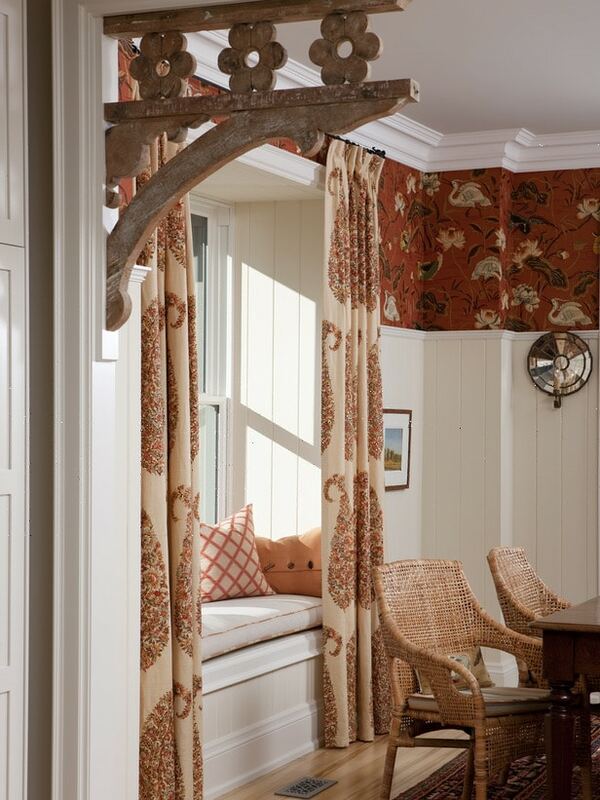 .-= Lesley @ TheDesignFile´s last blog ..Design Star: Read a review here each Monday =-. Sarah? Sarah who? Sorry, just crawled under a rock apparently. I do see what you’re saying. I especially like the first room you’ve showed. 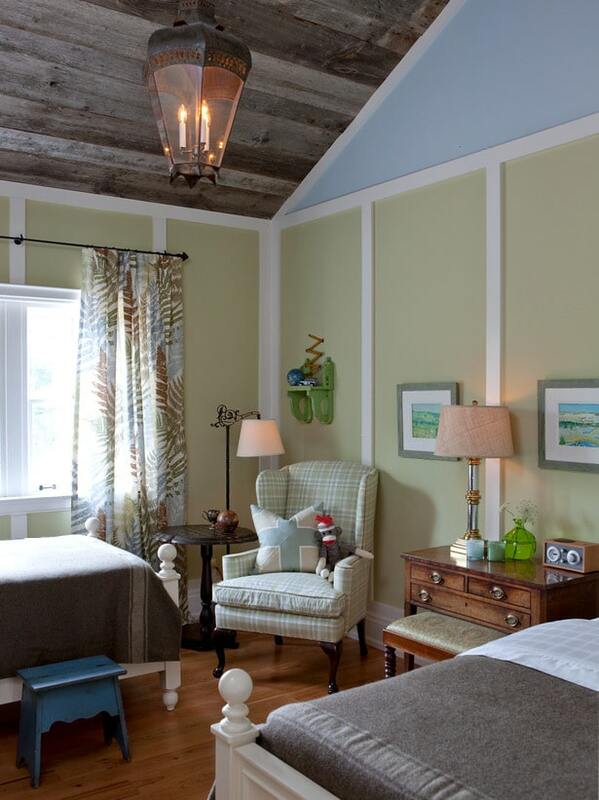 It’s wonderful, light and bright and the color is carried all around the room in fun ways. .-= Vee´s last blog ..Around the Yard~Mosaic Monday =-. I am crazy about the entire house – the colors, the scale of the pieces, the placement – one caveat: most of us do not have that kind of per room budget! And to the person who said re HGTV offerings – I second the motion! What in the world? Who wants to see endless House Hunters and endless Holmes on Holmes? Not me! Sarah is giving us real design! HGTV: are you reading the blogs? Melissa…I want to thank you for your encouragement as a blogger…sadly I have to leave the blogging world for a while…my post says why…please keep me in your prayers…it was a difficult decision. .-= Mary Joy @ Snapshots from my Heart & Home´s last blog ..Leaving Blogland for a while…I would really appreicate your prayers! =-. i totally missed this! thanks for telling me about it. i know i will love it! she’s my favorite! .-= meg duerksen´s last blog ..family night =-. .-= beth´s last blog ..Done =-. I haven’t watched HGTV in a while because it was too much! I love all these rooms and will definitely go check her out! Thanks for passing on the info! Have a blessed week! .-= Southern Fried Gal´s last blog ..Let’s Party! Practice Hospitality, Week 1 =-. I haven’t seen this show and I guessed it might be Sarah Richardson before I got to the bottom of your post! I’ve basically stopped watching HGTV because everything was the same or totally uninspiring. Looks like I’m headed back for a look/see! Thanks! .-= Karen B´s last blog ..Birdies and Berries =-. I love that show! Sarah is a fabulous designer! .-= Fabulous Finds Studio´s last blog ..Happy Memorial Day! =-. Love her style, what an absolutely gorgeous home! .-= Stephanie´s last blog ..My Favorite Fathers Day gifts from the past! =-. I ~heart~ Sarah’s farmhouse reno! It looks like tons of other’s do too. What is it about that house? It has such a homey feel to it, like being embraced in a warm hug! She’s amazing, mostly I love all the vintage and antique touches she brought to this project….really gives any home a one-of-a-kind feel. .-= Gail´s last blog ..Just kidding….. =-. Melissa! Thank you so much for these photos! I only caught a few episodes of this season at Sarah’s House myself and then saw the finale this weekend. All along, I have known that this house of hers is so exactly my style that I would need to find a way to get still photos, a dvd of the show… anything I can get my hands on to study and compare to my own home so I can tweak it into being all that it can be. I have always enjoyed Sarah’s aesthetic, but her style has never translated so directly to mine as this house does. Off to steal your photos now… Thanks! .-= Tracy´s last blog ..The New Navy =-. .-= katy´s last blog ..They Have Something to Say =-. I haven’t seen this show but I do like her style. It is fun and a little quirky. .-= Melanie´s last blog ..Getting To Know You! =-. going to go check it out. .-= teresa´s last blog ..We can get there from here- =-. A friend just recently told me about her show, and I seriously want to drool when I look at her work. These pictures are just BEAUTIFUL and increase my desire to put wood paneling up on my living room ceiling… yummy. .-= Robyn Meierotto´s last blog ..you know it’s summer when… =-. Sarah Richardson is my favourite designer, bar none. When we moved we lost HGTV, but I found that I could watch the shows online, AND they have Sarah’s Cottage and Design Inc online as well. My dream is to have Sarah give me some decorating specifics for this house we are remodeling! I’m so proud that she’s Canadian! .-= Lorrie´s last blog ..Signs Along the Way =-. Where do you go to get the shows online? We don’t have TV either. .-= Eileen´s last blog ..Papa, we may lose the crop =-. .-= Tamara´s last blog ..The Spring Season That Never Happened! =-. We don’t have TV. Anyone know if you can get the full episodes anywhere on the internet? I haven’t watch the show yet but this bedrooms are just adorable! Oh, I love Sarah Richardson. I’ve been following her since she was on Room Service, and of course I was a fan of Design, Inc. I hadn’t known she had a new show, though!!! I love, love, love those photos–I will have to check it out. Thanks for the tip! .-= Angela (Cottage Magpie)´s last blog ..Little Floral Prints =-. .-= Amanda @ Serenity Now´s last blog ..Hospitality: How We Greet Our Guests =-. I love her! I didn’t know she had a show on HGTV. What can one say but “SHE ALWAYS GETS IT”, and gets it…”JUST RIGHT”!!! I try never to miss her program~ so delightful! Appreciate the chance to more closely see these spaces, up “close and personal”!!! If I had my choice of designers to do my house, it would be Sarah! My mother and I enjoyed watching the unveiling of Sarah’s house over the weekend. I think it’s beautiful and so many pretty and creative ideas. Thank you for composing them here together. I also LOVE Sarah’s house!!! I know!! I love her too! I hate how she STOLE my life though!! Just kidding, I can’t even get mad at her for living my dream life cuz she’s just so good!! I love Tommy too! I need a Tommy sidekick in my life to shop with :) Love your blog! .-= Kelle Dame´s last blog ..PEONIES!! =-. I’ve never seen this show, but after seeing these beautiful photos I’ll definitely check it out! Thanks for sharing . .-= Donna´s last blog ..A Trip to Saint George Island and Apalachicola, FL. =-. I die! THRILLED you have these pics!! Just “found” the farmhouse show; and now FLN is off the air!!! I don’t have Sarah’s House on HGTV in Texas. It was on FLN. I agree with many HGTV stinks now! Candace is the only fine one left. I must find Sarah’s shows online. Thanks SO much for capturing these fab photos!!! I tried to watch, but was kind of put off by her overly cutesy manner, particularly since she’s not 20. (Neither am I.) I guess it’s okay, because while her style is certainly well-done, it’s not really a style I am interested in. I LOVE Sarah Richardson too as do my 2 daughters. We are from Sydney Australia and my daughter (who wants to be an interior designer just like Sarah) has actually written to her to ask if she can do work experience – in Canada!!! The farm house and her island cottage are our favourites. I am a die hard fan of Sarah’s house. Each week I can hardly wait to see what she does next. She is amazing. I love how she mixes vintage, antique and custom to make it truly one of a kind. I just don’t think I could sell it after I had worked so hard and made it so perfect with everything so lovely, colorful and down right wonderful! .-= Jean´s last blog ..Simple Woman’s Daybook =-. Some people have sooo much talent. Love the fresh look. Seems like the trend was dark for so long. Happy to see the light. Painted our dark paneled living room. Yes there are people who still have paneling! While lots of work, it was a huge success! looks like some of the photos of Sarah’s House. As a photographer I like to mix things up and agree with Jean (poster) that the mix of styles works to make it an original. Thanks Melissa for the fun and informative blog. Can’t wait to see what’s next! I haven’t watched her show but there is a ton of eye candy on her website. I will browsing for hours! I love it! I haven’t seen the show because I’m in the UK and don’t actually have a television (!) but the colours and patterns in those shots are wonderful and so completely refreshing and un-hackneyed. .-= Sarah @ Natural History´s last blog ..Sneak Peek – Entomology Notebooks =-. It is a great show! It is one of the only shows that I enjoy watching on HGTV… I love her mix of vintage and new pieces. 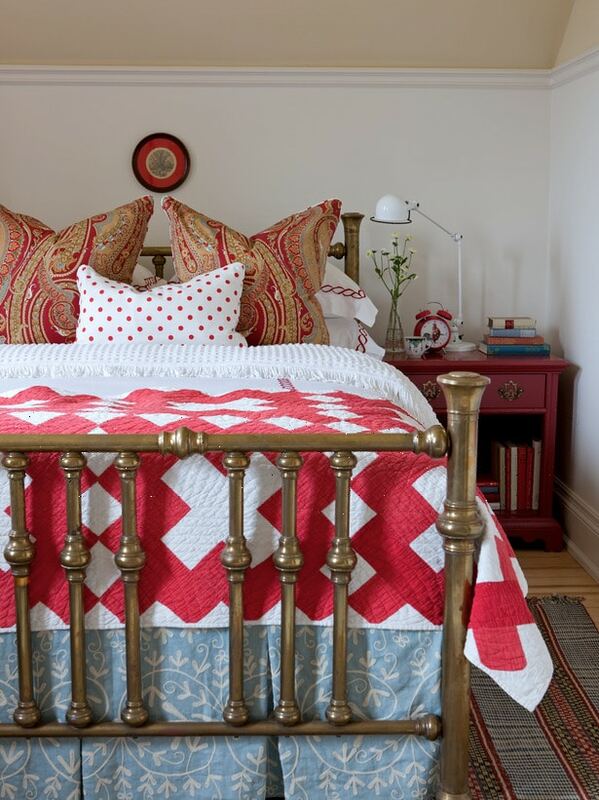 I LOVe how she plays with color and pattern – it’s totally my style!! Thanks for all the inspiration – i’m going to have to check her show out!! .-= gina, blogmania PR´s last blog ..Kuki Kids =-. I love Sarah as well. I appreciate the fact that she tells you where to splurge and where to save. We may not have the budget she has or the time to do it all at aonece but I love using her as a road map. I have learned much from her. Hope she continues to be on HGTV…they need designers that will teach as they go along a project. I’ve been bitten by the Sarah bug too! I heart every room she touches! So glad you shared Sarah with us! I must be the last person to hear about her, but I love what I see! The best way for me to describe my thoughts on this house is that looking at the pictures was like eating a warm chocolate chip cookie. .-= Jocelyn Stott´s last blog ..Wedding Recap: Part II =-. I am truly 100% obsessed with that show!!! I am heartbroken that the last show was on the other day, but she did an amazing job with that old farmhouse. I hope she does another one!!! I SERIOUSLY have a problem! I am a SARAHS HOUSE ADDICT! I love that show SO MUCH! I didn’t even know it existed (because I am a die-hard Candice Olson fan and pretty much only watch her show) but I came across it on the day she did the Mud Room. She had me as soon as she painted those doors red! Then I DVR’d every episode since and have now seen her do the entire house – I don’t want it to end. She needs to buy another farm QUICK!!! I am a new Sarah fan too..what I notice about her style is no fear of color and pattern. It reinforces what I want to do in my own home decorating. The guttsier a color is, put together with patterns that connect to that color, well, the result is gratifying..and I love special pieces of furniture that add that certain one of a kind quality to the design. 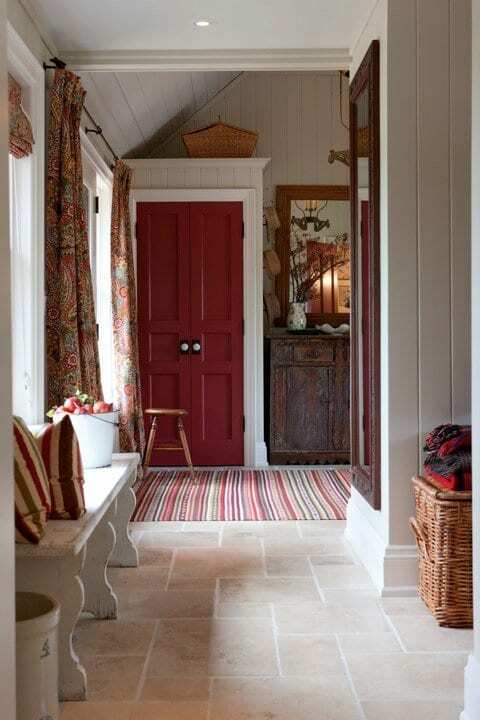 I loved her red paint in the farmhouse mudroom area. Nice post. I’m also a big fan. I love how her designs don’t look “designer”. The rooms look warm, cozy and appear to have developed over time. She would be my top pick for a designer to come into my house. I hope HGTV continues her shows! I am a fan of Sarah Richardson and have been watching her shows for years. Before Sarah’s House, she had a show called Room Service and one called Design Inc. I really liked Design Inc, because it showed her during the design process and I saw how she encountered many of the same problems on a job as I do (I am also an Interior Designer and Architect). She has a great website, SarahRichardsonDesign.com, that has pictures of her projects including Sarah’s house. She usually gives a list of the paints, fabrics and furniture she uses. It also has articles she has written for a Toronto newspaper about the rooms on Sarah’s House. If you like her and her design, you should check out her website!! .-= LuxuriousLife´s last blog ..Have you impressed yourself today? =-. Thank you for spotlighting one of my favorite designers! I’ve been a Sarah Richardson stalker for years now and my computer is filled with pictures from her portfolio and my DVR is full of so many of her episodes from Design, Inc. to Sarah’s House to her older programs. I think I’m so smitten because she begins her design process with beautiful fabrics — something that I love and am drawn to as well. Love everything she does, but especially the cottage and farm! Adding…I don’t think it’s just you that craves color and pattern in the NW. I am in Texas and I am so over the dark, heavy Tuscan looks of so many homes here. I think another big reason I’m drawn to Sarah Richardson’s looks is that she seems to breathe fresh air into a room, even with those rooms she infuses with color and pattern feel so fresh and alive. Another great Canadian designer and color expert, Maria Killiam, from Color Me Happy, does something very similar in her designs. Not sure if being Canadian has anything to do with it, but I love both of their aesthetics in that their rooms feel so fresh and alive. Something my home is in great need of and what I’m working on with Maria Killam via e-mail and the web. Isn’t 21st century design amazing with tv, the web and all the amazing resources we have available now? On another note, sometimes it makes me feel way behind and/or left out when you see these shows and then begin yearning and coveting. I told my husband that I’ve been so unhappy in this house that I tend to “live” in the photos I’ve collected and wonder if we will ever achieve the ambiance I crave and love. We’re working on it but it’s just such a slow process and tough to balance the realization that the tv shows have massive budgets and help. Still, I know there is hope because I am determined! Thanks again for a beautiful and inspiring post. I really love the … it looks like a wrought iron floor lamp in the third picture from the top, the green boys’ bedroom. Any idea how I could find out where she got it? I absolutely ADORE Sarah’s house! Her technique and style are amazing and really catches the eye. I’m anxiously waiting for season 4 to begin!! She’s the master of mixing pattern and has such a light touch to style in her decor. Is Design Inc the newest show and Sarah’s House older? Sarah is a genious! I could watch her show over and over and over! I adore adore that show. By far my favorite show on HGTV. BTW I am also a big fan of your blog. I am a northwest gal myself, themoderncottagecompany.blogspot.com. Ive been watching different seasons of Sarah’s House on HGTV in Ft Lauderdale, Fl area. I absolutely adore the show! Can’t get enough of it. It seems as if its winding down. We just saw what could be the last episode of Sarah’s Summer Cottage. Say it isn’t so! Is there more to come? I’m already experiencing withdrawal! I’ve been watching different seasons of Sarah’s House in the Ft. Lauderdale, FL area. I absolutely adore the shows! Can’t get enough of it. It seems as if its winding down. We just saw what could be the last episode of sarah’s Summer Cottage. Say it isn’t so! Is there more to come? I’m already experiencibng withdrawal!